God is a God of order. He plans, organizes, and carries out His purposes. It is our task and opportunity to submit to those plans through obedience to His will. The arrangement of everything in the camp of Israel and the tabernacle was set forth by the Lord, not man. This post will focus on a major overview of the courtyard and tabernacle, their dimensions and features (Chapters 3 and 4, 'Made According to Pattern', by C.W. Slemming). Future posts will delve into the spiritual significance and symbolism of Christ in each aspect of the tabernacle. When the children of Israel made camp in the wilderness, the tabernacle was to be situated in the center of the camp. The twelve tribes of Israel had their designated positions surrounding the tabernacle, organizing some 1.5 million people. The camp of Israel moved with the Lord's direction, following the pillar of cloud. When He moved, they moved. When the children of Israel broke camp, each tribe (except for the Levites) was charged with carrying a specific part of the tabernacle, whether it be the fence, the tabernacle's components, the furniture, or the sacred emblems. The Levites were charged with the assembly and take down of the tabernacle at each site. Everyone had an important function and responsibility to perform. All that mattered was that each individual performed their function according to his best ability. The Court: The tabernacle was positioned within a rectangular courtyard 100 cubits long and 50 cubits wide. There are many slightly varying lengths for a cubit, but most are between 18 and 20 inches. The courtyard was bordered by large curtains supported by 60 bronze pillars, with 10 on the East and West sides each and 20 on the North and South sides each. Two pillars were united at each corner. The pillars were buried in the sand using a foundation of bronze sockets into which they were inserted. Each pillar had a silver cap. The pillars were connected using a silver connecting bar which also held silver hooks to hang the curtains. The curtain's pillars were further strengthened by use of cords and bronze tent pegs. On the East side, the entrance, the center four pillars formed a gate from which hung a 20-cubit screen woven of blue, purple, and scarlet yarn and fine linen thread. The opening or entrance to the tabernacle faced the rising sun, thus should our hearts be directed towards the Son of God. All other curtains of the courtyard were made of white linen. In the court there were two pieces made of bronze or of wood overlaid with bronze. The first was the largest, the bronze altar, which was the great place of sacrifice: 5 cubits square and 3 cubits high. Halfway between the altar of burnt offerings and the tabernacle was the bronze laver, the place of washing for the officiating priests. The Tabernacle: On the West end of the court stood the tabernacle, 30 cubits long and 10 cubits wide. The tabernacle was constructed of 48 boards, each 10 cubits high and 1.5 cubits wide, having two tenons or feet at the bottom. These feet were inserted into 96 silver sockets, each weighing about 125 lbs. The boards were bound together by 15 bars, five on the North, South, and West sides. These crossbars passed through a series of rings which were joined to the boards. On the East side, five pillars were set into bronze sockets, which upheld a door made of curtains of blue, purple, and scarlet yarn and fine linen thread. 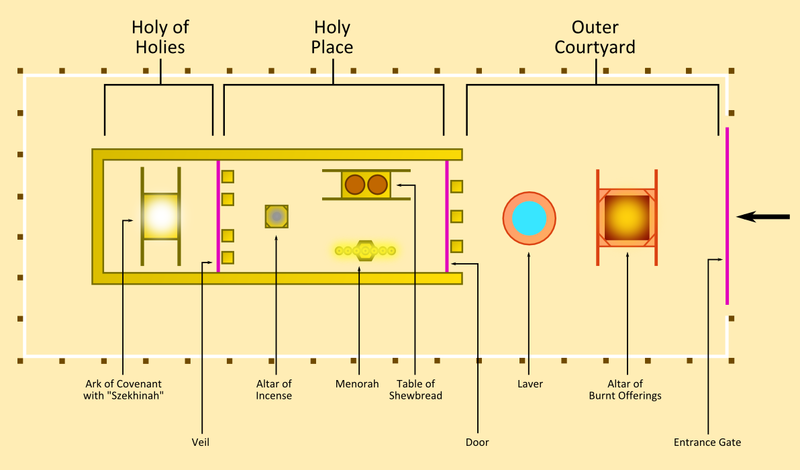 A veil of the same size and materials, but also embroidered with cherubim and hanging on four pillars set into sockets of silver, made a partition between the only two rooms of the tabernacle: The Holy Place (20 cubits long) and The Holy of Holies (a perfect cube of 10 cubits). The roof was made of two parts. The first was a layer composed of 10 curtains fastened together made of blue, purple, and scarlet yarn and fine linen thread with cherubim woven in, this measured 28 by 40 cubits and was attached in some manner to rams' skins dyed red. Over and above the first layer were 11 curtains of goat hair, joined together, measuring 30 by 44 cubits, attached in some manner to badger's skins. In the Holy Place were three pieces of furniture, all made of gold or of wood overlaid with gold: the 7-branched candle on the left, the table of showbread with 12 loaves on the right, and the altar of incense directly ahead. One only item stood in the Holy of Holies, the Ark of the Covenant, with two cherubim and the mercy seat on the outside and a golden pot with manna, Aaron's rod that budded, and the two tablets of the covenant inside. The overview provided here is intended to highlight the progression that one passes through as one enters the tabernacle and continues on until reaching the Holy of Holies. It represents our individual journey back to heaven and an abode with our Heavenly Father: sacrifice, purification, knocking on the door, bread of life, light of life, the holy spirit, and passing through the veil to enter the holy presence of the Lord.